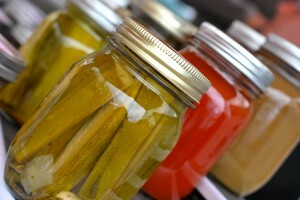 On Thursday July 17, Theresa from Garden Party will take us through pickling step-by-step with demos at 4pm and 6pm. Pickling is a great way to use those bushels of cucumbers that we all end up with in our gardens, and it is also a way to get creative and make some tasty snacks and side dishes for months to come. Learn how to make art with stuff from Nature July 3rd! Mother Nature has blessed us with a bounty of resources that not only feed and house us, but also clothe and adorn us! At the Uptown Market on July 3rd, people of all ages will have the opportunity to create a craft using materials provided by Mother Nature. Longtime Market vendor Shelley, of Shelley’s Stoneworks, will be showing us her fossil collection (most of which she has mined herself!) and for a few dollars, you can even take home your own lovely earth-inspired craft! Check out our incredible event line-up!